Lucknow, April 11: The first phase of polling for Lok Sabha Elections 2019 is underway in 20 states including Uttar Pradesh and people are exercising their right to vote. The Election Commission as well as the Prime Minister have requested voters to come out in large numbers and vote. In Uttar Pradesh, from Bijnor Lok Sabha seat, a bridegroom was seen casting his vote at a polling station in Bijnor. Bijnor Lok Sabha Constituency in Uttar Pradesh: Candidates, Current MP, Polling Date and Election Results 2019. 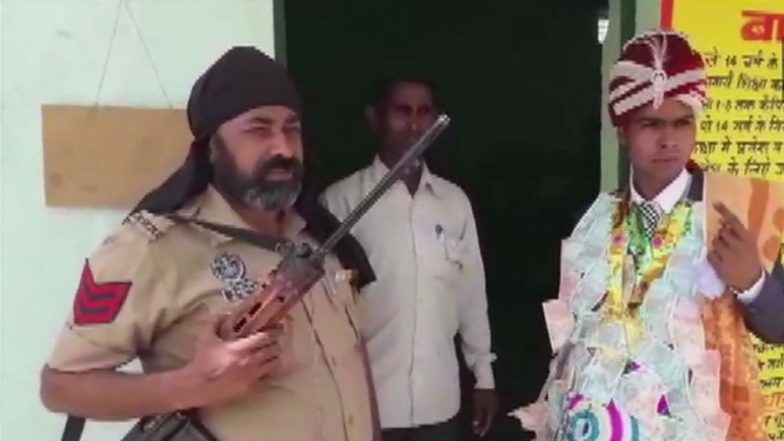 The bridegroom was still in his wedding attire and was also seen sporting a garland of currency notes outside the polling booth. Uttar Pradesh Lok Sabha Elections 2019: Phase I Voting Underway For Saharanpur, Kairana, Muzaffarnagar And 5 Other Constituencies in UP. This instance shows how much voters value exercising their voting rights. Voting in India represents a festival where people get together to choose their representatives. The Bijnor Lok Sabha constituency is one of the eight constituency where polling is underway in Uttar Pradesh since 7 in the morning. Raja Bhartendra Singh of the Bharatiya Janata Party (BJP) is the sitting MP from the seat. Congress's Nasimuddin Siddiqui, Bharatiya Janata Party's Raja Bhartendra Singh and Mahagathbandhan's (the alliance between Samajwadi Party and Bahujan Samaj Party) candidate Malook Nagar is in the fray from this seat.